Three television commercials, 60, 30 and 15 seconds, introduce us to the transforming powers of the Tasmanian water. An old narrator, played by John Flaus, holds a ukelele, then guitar then balalaika, telling the imaginative story of how the pure waters of Tasmania are special, and have the power to make things better. The local community gathers to dunk a wide range of objects into the water and receive improved and somewhat surprising versions in return. 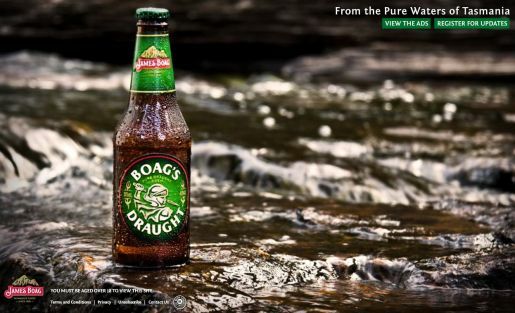 A consumer website, www.boagsdraught.com.au, is currently being developed by Holler Sydney. Currently the site provides links to the James Boag’s YouTube channel. The Pure Waters campaign was developed at Publicis Mojo, Sydney, by creative director Micah Walker, senior art director Steve Wakelam, senior copywriter Grant McAloon, agency producer Jasmin Ferguson, account service team Simon Ludowyke, Tara Seymour, and head of strategy Nicole Milward. Filming was shot by director Steve Rogers via Revolver Film with director of photography Geoffrey Simpson, producer Michael Ritchie, production designer Steven Jones-Evans. Editor was Alexandre De Franceschi at Guillotine. Visual effects were designed at Fin Design & Effects, supervised by Justin Bromiley. Colourist was Ben Eagleton at Bean Colour. Sound was designed by Simon Lister at Nylon Studios. Music was composed by Elliott Wheeler.